Are you throwing an original, creative party? Have a banner that’s equally as original and creative with Balloons Blank Sign Banner. This banner provides approximately 37 inches wide by 12 inches tall blank space in the center that can be personalized with anything you’d want. 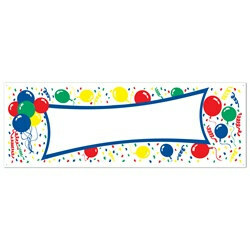 So tailor Balloon Blank Sign Banner to fit the personality of the person you’re throwing the party for. Round out your original celebration with All-Purpose Card Box, Beads w/Name Badge Medallion and Birthday Partygraph.